Definition at line 128 of file FlexLexer.h. Referenced by CChemEqParser::switch_streams(), CEvaluationLexer::switch_streams(), CChemEqParser::yyrestart(), and CEvaluationLexer::yyrestart(). 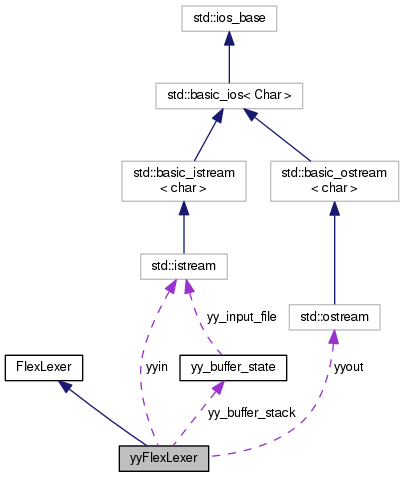 Referenced by CChemEqParser::switch_streams(), CEvaluationLexer::switch_streams(), CChemEqParser::yypop_buffer_state(), CEvaluationLexer::yypop_buffer_state(), CChemEqParser::~CChemEqParser(), and CEvaluationLexer::~CEvaluationLexer(). Referenced by CChemEqParser::yy_init_buffer(), and CEvaluationLexer::yy_init_buffer(). Referenced by CChemEqParser::yyinput(), and CEvaluationLexer::yyinput(). Referenced by CChemEqParser::yy_create_buffer(), CEvaluationLexer::yy_create_buffer(), CChemEqParser::yyrestart(), and CEvaluationLexer::yyrestart(). Referenced by CChemEqParser::yy_flush_buffer(), CEvaluationLexer::yy_flush_buffer(), CChemEqParser::yy_switch_to_buffer(), CEvaluationLexer::yy_switch_to_buffer(), CChemEqParser::yypop_buffer_state(), CEvaluationLexer::yypop_buffer_state(), CChemEqParser::yypush_buffer_state(), CEvaluationLexer::yypush_buffer_state(), CChemEqParser::yyrestart(), and CEvaluationLexer::yyrestart(). Referenced by CChemEqParser::switch_streams(), and CEvaluationLexer::switch_streams(). Referenced by CChemEqParser::yy_switch_to_buffer(), CEvaluationLexer::yy_switch_to_buffer(), CChemEqParser::yypush_buffer_state(), CEvaluationLexer::yypush_buffer_state(), CChemEqParser::yyrestart(), and CEvaluationLexer::yyrestart(). Referenced by CChemEqParser::yy_get_next_buffer(), CEvaluationLexer::yy_get_next_buffer(), CChemEqParser::yyinput(), and CEvaluationLexer::yyinput(). Definition at line 195 of file FlexLexer.h. Referenced by CChemEqParser::CChemEqParser(), CEvaluationLexer::CEvaluationLexer(), CChemEqParser::yyensure_buffer_stack(), CEvaluationLexer::yyensure_buffer_stack(), CChemEqParser::~CChemEqParser(), and CEvaluationLexer::~CEvaluationLexer(). Definition at line 194 of file FlexLexer.h. Referenced by CChemEqParser::CChemEqParser(), CEvaluationLexer::CEvaluationLexer(), CChemEqParser::yyensure_buffer_stack(), and CEvaluationLexer::yyensure_buffer_stack(). Definition at line 193 of file FlexLexer.h. Referenced by CChemEqParser::CChemEqParser(), CEvaluationLexer::CEvaluationLexer(), CChemEqParser::yyensure_buffer_stack(), CEvaluationLexer::yyensure_buffer_stack(), CChemEqParser::yypop_buffer_state(), CEvaluationLexer::yypop_buffer_state(), CChemEqParser::yypush_buffer_state(), and CEvaluationLexer::yypush_buffer_state(). Definition at line 183 of file FlexLexer.h. Referenced by CChemEqParser::CChemEqParser(), CEvaluationLexer::CEvaluationLexer(), CChemEqParser::yy_get_next_buffer(), CEvaluationLexer::yy_get_next_buffer(), CChemEqParser::yy_get_previous_state(), CEvaluationLexer::yy_get_previous_state(), CChemEqParser::yy_load_buffer_state(), CEvaluationLexer::yy_load_buffer_state(), CChemEqParser::yy_switch_to_buffer(), CEvaluationLexer::yy_switch_to_buffer(), CChemEqParser::yy_try_NUL_trans(), CEvaluationLexer::yy_try_NUL_trans(), CChemEqParser::yyinput(), CEvaluationLexer::yyinput(), CChemEqParser::yypush_buffer_state(), CEvaluationLexer::yypush_buffer_state(), CChemEqParser::yyunput(), and CEvaluationLexer::yyunput(). Definition at line 190 of file FlexLexer.h. Referenced by CChemEqParser::CChemEqParser(), CEvaluationLexer::CEvaluationLexer(), CChemEqParser::yy_switch_to_buffer(), CEvaluationLexer::yy_switch_to_buffer(), CChemEqParser::yyinput(), CEvaluationLexer::yyinput(), CChemEqParser::yypop_buffer_state(), CEvaluationLexer::yypop_buffer_state(), CChemEqParser::yypush_buffer_state(), and CEvaluationLexer::yypush_buffer_state(). Definition at line 209 of file FlexLexer.h. Definition at line 207 of file FlexLexer.h. Definition at line 208 of file FlexLexer.h. Definition at line 177 of file FlexLexer.h. Referenced by CChemEqParser::yy_load_buffer_state(), CEvaluationLexer::yy_load_buffer_state(), CChemEqParser::yy_switch_to_buffer(), CEvaluationLexer::yy_switch_to_buffer(), CChemEqParser::yyinput(), CEvaluationLexer::yyinput(), CChemEqParser::yypush_buffer_state(), CEvaluationLexer::yypush_buffer_state(), CChemEqParser::yyunput(), and CEvaluationLexer::yyunput(). Definition at line 185 of file FlexLexer.h. Referenced by CChemEqParser::CChemEqParser(), and CEvaluationLexer::CEvaluationLexer(). Definition at line 202 of file FlexLexer.h. Referenced by CChemEqParser::yy_get_previous_state(), CEvaluationLexer::yy_get_previous_state(), CChemEqParser::yy_try_NUL_trans(), and CEvaluationLexer::yy_try_NUL_trans(). Definition at line 201 of file FlexLexer.h. Definition at line 212 of file FlexLexer.h. Definition at line 211 of file FlexLexer.h. Definition at line 214 of file FlexLexer.h. Definition at line 215 of file FlexLexer.h. Definition at line 216 of file FlexLexer.h. Definition at line 180 of file FlexLexer.h. Referenced by CChemEqParser::yy_get_next_buffer(), CEvaluationLexer::yy_get_next_buffer(), CChemEqParser::yy_load_buffer_state(), CEvaluationLexer::yy_load_buffer_state(), CChemEqParser::yy_switch_to_buffer(), CEvaluationLexer::yy_switch_to_buffer(), CChemEqParser::yyinput(), CEvaluationLexer::yyinput(), CChemEqParser::yypush_buffer_state(), CEvaluationLexer::yypush_buffer_state(), CChemEqParser::yyunput(), and CEvaluationLexer::yyunput(). Definition at line 217 of file FlexLexer.h. Definition at line 186 of file FlexLexer.h. Referenced by CChemEqParser::CChemEqParser(), CEvaluationLexer::CEvaluationLexer(), CChemEqParser::yy_get_previous_state(), and CEvaluationLexer::yy_get_previous_state(). Definition at line 163 of file FlexLexer.h. Referenced by CChemEqParser::CChemEqParser(), CEvaluationLexer::CEvaluationLexer(), CChemEqParser::yy_pop_state(), CEvaluationLexer::yy_pop_state(), CChemEqParser::yy_push_state(), CEvaluationLexer::yy_push_state(), CChemEqParser::yy_top_state(), CEvaluationLexer::yy_top_state(), CChemEqParser::~CChemEqParser(), and CEvaluationLexer::~CEvaluationLexer(). Definition at line 162 of file FlexLexer.h. Referenced by CChemEqParser::CChemEqParser(), CEvaluationLexer::CEvaluationLexer(), CChemEqParser::yy_push_state(), and CEvaluationLexer::yy_push_state(). Definition at line 161 of file FlexLexer.h. Referenced by CChemEqParser::CChemEqParser(), CEvaluationLexer::CEvaluationLexer(), CChemEqParser::yy_pop_state(), CEvaluationLexer::yy_pop_state(), CChemEqParser::yy_push_state(), CEvaluationLexer::yy_push_state(), CChemEqParser::yy_top_state(), and CEvaluationLexer::yy_top_state(). Definition at line 204 of file FlexLexer.h. Referenced by CChemEqParser::CChemEqParser(), CEvaluationLexer::CEvaluationLexer(), CChemEqParser::~CChemEqParser(), and CEvaluationLexer::~CEvaluationLexer(). Definition at line 205 of file FlexLexer.h. Definition at line 173 of file FlexLexer.h. Referenced by CChemEqParser::CChemEqParser(), CEvaluationLexer::CEvaluationLexer(), CChemEqParser::yy_get_next_buffer(), CEvaluationLexer::yy_get_next_buffer(), CChemEqParser::yy_load_buffer_state(), CEvaluationLexer::yy_load_buffer_state(), CChemEqParser::yyinput(), CEvaluationLexer::yyinput(), CChemEqParser::yyrestart(), and CEvaluationLexer::yyrestart(). Definition at line 174 of file FlexLexer.h. Referenced by CChemEqParser::CChemEqParser(), CEvaluationLexer::CEvaluationLexer(), CChemEqParser::LexerOutput(), CEvaluationLexer::LexerOutput(), CChemEqParser::switch_streams(), and CEvaluationLexer::switch_streams().